So it's nearly 2010, and I am now starting to think of my new running goals. This is actually a new thing for me. Last year my running goal; my ONLY running goal; was to run 10K. I had only been running for 2 months, and at the time 10K seemed like the furthest I could run. EVER! Now I am a year into running and my goals have increased with confidence. The races I am contemplating now as so above my previous expectations, that I should feel they are impossible. However I don't. Okay, maybe I shouldn't have written the blog drunk, I am sure I will wake up tomorrow and think, "EDIT, EDIT"
This time last year I never considered myself a runner. I definitely did not consider myself a Minimalist runner - running without shoes, are you CRAZY! Now, I can't even contemplate a week where I haven't run at least 3 times. I don't even consider 5K a run. I don't even consider 10K a long run; that's becoming maintenance. I am running 8-9 miles (some of it up a mountain) and I am now barely winded. As for shoes, well forget it. There is no way I am going near my runners again. In fact my only use for my $100+ "motion control" shoes is to keep the door open. This time last year I never considered myself a tri-athelete either. That just seemed too healthy and it interfered with the 'couch-potato' persona I was cultivating. However, that is starting to become a reality too. Thanks to fantastic coaching I can now swim about 500-750m. Okay it's not a brilliant time, but two months ago I couldn't swim, so this is huge. The cycling is proving harder. I once heard that you are either a runner or a cyclist - my legs are so used to running, that they are complaining about the cycling. My legs just can't seem to get the idea that cycling ISN'T cheating..
to do a sprint tri-atholon. Perhaps do a standard tri-atholon. As for my personal goals - well I suppose they are more varied. Think about getting a job. Who know's what my 2011 goals, but if I manage to achieve my 2010 goal, I can see something bigger or longer on the horizon. Me. Who am I? Answers on a postcard, because I don't have a clue. I have no idea; I am so many contradictions in one place that I am not sure there is one answer. I make no sense - perhaps that's exactly what I am. Something that is not designed to make sense. So okay let's start with the basics. I am on the wrong side of 35, but the right side of 40. Despite this I feel like I am 18 most of the time. I am a woman, but I have held my own with the men, both in work and social life for the last 20+ years. I think I understand men more than I do women. I actually find face-to-face relationships with woman either annoying or funny. (There are of course exceptions, but my female friends are as quirky as me). I am an unconventional traditionalist. I was married at 25 and I have one boy, despite never wanting a husband or kids. I went to University and post-grad, but I am not intelligent. I know lots of things, but none of them useful. I am completely unorganised but I hate being late for anything. I always saw myself as a career woman, but I have had so many different careers it's silly, and am currently not working. I work a 60+ hour week, but I don't earn any money. One the outside I dress plainly, but I am a hidden goth, punk, rock chick on the inside. I am not tall, but I was the only woman who was allowed in the Mosh-pit at concerts. I seem like I should be polite, but I can curse in different languages. I like to run, but hate to wear running shoes. I enjoy swimming, but I am nervous around water. I have a resting heart rate in the 40-50's and a BP of 100/60-70, but I am not an athlete. I can flip a 40lb pre-schooler in the air with no problems, but I cannot open a jar of pickles without help. I believe in God but not religion. My husband works in the games industry, but I hate playing computer games. I am the most optimistic depressive I know. I desperately want to be settled but have spent the last 7 years of my life organising international moves. I haven't lived in one place longer than 12 months in that time. I can build a peer-to-peer/core/dial-up/Wi-Fi and VoIP networks in my sleep, but I find configuring my PVR stupid and annoying. I can make or fix anything out of well.. anything, however I seem to be unable to balance my cheque book. I can convert imperial to metric measurements in my head, but I still don't know how much I really weigh, or my height. I am the only one in the house that can fix anything and owns the toolkit, but I am not a good cook. I never fit in socially, despite being the one who organises the nights-out. None of my physical features match. No-one understands me, unless they are as Kookie as me. You can see my problem. I can't even get a handle on me - so I doubt anyone else could too. It's good though. I think anything else would be boring, and who would want to be that. Okay this post is about a day late. Not doing to well on those deadlines am I? Anyway, as I mentioned in my introduction post, I have a son who POTENTIALLY has Asperghers Syndrome. I say potentially, because he is still waiting for assessment AND I am not entirely convinced. However, I am sure that will come up in future blogs. I realised my blog last week was huge, so I am going to try and break the blogs down a bit. Apart from anything, it means I get more blogs for my money. :) Being creative and witty is just to hard to do extensively. So this blog is about him from birth to about 2.5yr. This is mainly to do with our first stay in Canada. So, my son [I'll call him D]; he is... fun, loving, smart, happy, cheeky and I love him. Okay blog over.. hehe..
Really, he has always had a few little quirks. I have always known that, but as he is and only going to be my only child, I had no way of comparing his quirks to anyone else. He had a difficult birth, and didn't seem to do anything for the first 24 hours. After that, all he did was scream. Every time you put him down he screamed. It was then that the conventional rules changed. The only way we could get him to sleep was by bed-sharing. The only way we could calm him down was by baby-wearing. It took us seven weeks to figure that out in which time I suppose I started to lose my mind a little. At 4 months old, we all packed up and shipped off from the UK to Canada. What was I thinking? D handled it great - but the loss of family and support from the UK made my Post-partum Depression worse. I wasn't diagnosed for 10 months, and I sometimes wonder if that affected him. He was always active. Crawling at 5 months; walking at 12. His language never developed. He wasn't really talking till he was 2. He is adventurous, and I don't think there was any way to baby proof the house. He did like company, but he never deliberately sort it out. He was always smart and he could figure out anything from just watching once or twice. It used to freak me out all the things he could do. Group activities never suited him. He didn't like to participate and when he did he was always doing his own adventures. He would never relate to the group. I suppose his main quirk has his activity level at this time. I don't think he stopped for a minute. He went from 2 to 1 nap at 9 months and he practically gave them up altogether at 18-24 months. He would always be moving and I lost a lot of my pregnancy weight chasing him when he learnt to walk. He never cared about where I was, or where he was going as long as he was moving. I saw all these quirks and I just thought it was him. There was nothing wrong with him. He is just an active, curious, adventurous little boy. He wasn't in any daycare or pre-school at this point, so there were no outside bodies telling me there was anything wrong. Friends of mine didn't really see him that much, so again, I didn't have any feedback on what they thought. I was tired and emotionally strung out dealing with all his antics, but isn't every Mom? I honestly can't think of what I missed. I know this post is a bit rubbish. Life here has been a bit off the last week and my mind isn't in the right place. When I get my Mojo back, I will probably update it with more humorous comments and wise-cracks. So I suppose the question is really, why at the 'not-so-tender' age of 36 did I start? Well, about a week before my international move from Australia to Canada (I have had 3 International moves in 4 years but that is another story), I was in a car accident. Nothing too serious; I was rear-ended, but it was apparent from some of the CT scans they ran that I MAY be developing Osteoporosis. As I couldn't have any tests done after landing in Canada as our health care wasn't fully available, I decided to pro-actively do something about it whilst I was waiting. The most pro-active thing you can do is take Calcium, VitD and run - so I did. A friend of mine was also interested in starting to run, so in November 2008, we started training for a 10K in April. Nothing too serious 2-3 times a week, we both started at 20 mins, then tried to progress to 5K. At this time my son starting to have his own issues at pre-school, and this was a way for me coping with the stress that was emanating from that. When he had to leave pre-school it was me running, pushing a 35lb 4 year old in a stroller. Now that was interesting. There is only so many times you can pant the 'ABC song' to a grumbling pre-schooler who is being force feed snacks just so he would stop moaning!!! Oh the horror - breathe... that's the past. Ahh think happy thoughts. Everything was going well. Even managed a couple of 10K training runs by February. I then decided to do a local 5K road race. My friend was sick that week and I decided to do run the race at the last minute instead of a training run. I had some niggling foot problems, which the doctor put down to PF and that I should quit running completely. It didn't feel like PF and wasn't that bad, so I pretty much ignored him.. Bad move. He was wrong, I was right, it wasn't PF; it was much worse. In the last 1K of my 5K, I developed severe stress fractures on my Talus and Calcaneus. (BTW Still managed a great time considering I limped the last 1K - 30.11). It took 3 trips to the ER, 2 x-rays and a bone scan to get the results. After I was unable to rest my foot; I have an over-active 4/5 year old, so I was placed into an air cast and my running days seemed numbered. Overall I was unable to run for about 8-9 weeks. I may mention that these runs were all using 'Running store approved' shoes etc. All correctly fitted - top of the line shoes. Thought I would say that before I get all the comments.. Yes, I know who you are... "nah nah, should have used proper running shoes from a store... nah, nah, minimalist running is a pile of croc"... I hear you... I am a Mum remember, I know all! I wasn't doing any heavy milage, so why the stress fractures? I had a bone density scan at this point. My bone density was fine, so Osteoporosis obviously wasn't the problem. I figured it was the way I was running. I must be heel-striking something awful, there had to be another way. My form was horrendous. If Whales had heels, I would be the God of whale heel-strikers.. Did that make sense? The Alcohol hasn't even started yet, oh dear.. This was when I looked into BareFoot/Minimalist running. 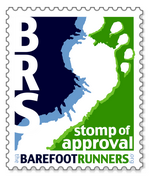 I was a lurker on the Runners World Bare-Footing forum and I decided that perhaps this was the way to go. If I learnt proper form, then running (sometimes in running shoes) would be better; no injuries. As I would have to start from the beginning again, this seemed perfect. In May I purchased my first Vibram Five Fingers [VFF]. I started slow. A mile or so on the indoor track. I was in socks, and I think I ran my first mile in about 14 mins. It was pretty scary and pretty great at the same time. After a few weeks, my confidence increased. I developed the usual Bare-Foot newbie problems. Calf Pain, Foot pain, 'Too Much Too Soon' [TMTS] Pain. I wasn't disheartened. Why should I be? I was running - actually running! After everything I was euphoric. Didn't bother me, that I was shoeless as long as it got the job done. Okay there were a few funny looks, but I am freak, so it didn't bother me. I started running trails in VFF's and loved it. My milage started to ramp up and my training partner announced she was considering a half-marathon in November. Would I be interested? I was very unsure. I was only 6 months out of injury. I wasn't an experienced runner and I had only been running in funky shoes. 13.1 miles seemed a lot. I had never run further than about 14K. However, much to her persistence I went for it. I went from being a fairly active non-runner, to being a minimalist runner who has completed her first half (in 2:07 I may add)!!! Despite all the problems I have been through, this year has exceeded my expectations. When I started last year, I was only planning on running 10K. In the end, I ran twice the distance in minimal shoes. My sanity was restored, but I am running with no shoes, most people here would have me committed. So perhaps that point is still to be debated. The Future, well I have successfully completed a 'Lose the Shoes Plan', now I am on a 'Lose the VFF's Plan'. My training partner is contemplating a full Marathon in May.. What do you reckon? Can I manage that with no shoes at all? Who know's - this time last year I could barely run 20 minutes on a treadmill!